How do gas prices today compare to the price over the last 10 years? Are they higher, lower or about the same? Take 5 min and scan the net. 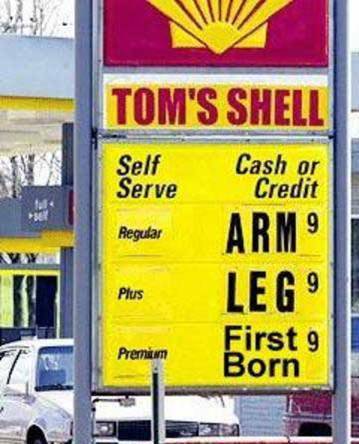 Look for the highest gas price in the United States. Look for the lowest. What state or city has the highest gas prices? Lowest? Are we in an Oil crises? At are current oil consumption rates are we going to run out? Below are questions a teacher sahoud pose during the hook presentation and discussion afterward. Based only on the oil reserves in the United States and current US oil consumption rates when would the US run out of oil if the US did not import any? How can you predict future oil comsumption in the united States for the next 50 years? Why is the US so relieant on foreign oil? What is the importantance of worldwide oil resereves? Who has the largest oil reserves and who uses the most oil? Based on worldwide oil reserves and consumption when should the world reach an oil crisis? What alternatives are available to decrese American's comsumption and depence on oil? natural resource - Materials that are obtained from the earth, such as petroleum, coal, and water and are essential or useful to humans. Determine average US oil comsumption per person for previous 50 years. Expand analysis to worldwide oil reserves, comsumption, population growth using pie charts by region to show worlwdie production and consumption rates for oil. Determine how many days left at current consumption rate until we consume all estimated worldwide oil reserves based on constant oil comsumption rate per person. The US would run out of oil in 2010 based on current consumption rates and the oil reserves in the US. Deterine how much oil each person in the US uses per year? Has then value been stradily increasing, decreasing, or staying constant over the last 30 years? Over the last thirty years the consumption of oil per person has been roughly constant at 15 barrels per year. Below are questions that students or teachers may want to find answers for after completing the project. How much oil does the US import per year? Where does the imported oil for the US come from?